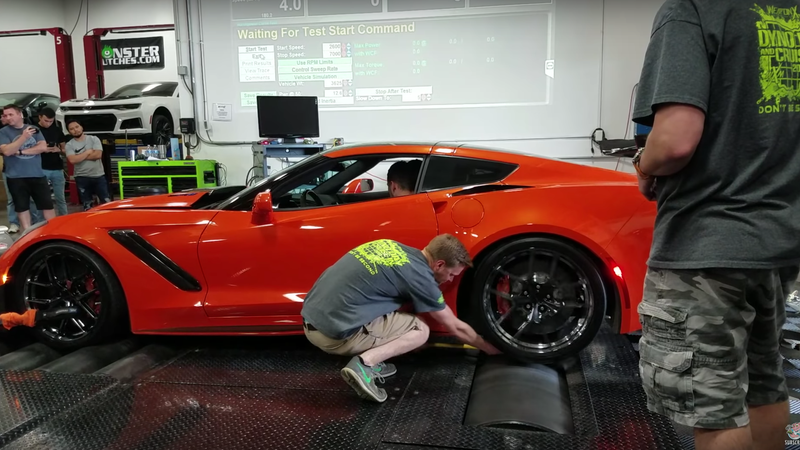 The 755-horsepower 2019 Chevrolet Corvette ZR1 is great for the dyno. It has a monstrous factory power rating, but losses in the drivetrain mean that number isn’t what ultimately goes to the wheels. The dyno helps find out how big that power loss is, but it can also make a person lose control of their limb. That’s what happened when a ZR1 went on a dyno recently, and an assistant’s arm got sucked underneath the wheel while getting ready for the run. The ZR1 dyno mishap was said to have happened at a shop called Weapon X in Cincinnati on May 5, according to YouTube channel Viral Hog. The channel pays for video submissions, and the person who submitted this one told the channel that the man whose arm went under the car was trying to brush out some rocks picked up on the street from the tires before making a run. But the broom got caught, sucking it and the man’s arm under the car’s tire. Onlookers in the video seem to be laughing after he stands up, but Jalopnik has still reached out to the shop to make sure he didn’t have any serious injuries (and to confirm that the accident did happen there). Dyno tests are great and informative, but try to stay safe if you do them. Also maybe ask to go two out of three if you lose a game of Rock, Paper, Scissors to decide who has to clean off the tires before the run.